To celebrate the 4th of July, my family grilled some tasty burgers and steaks in the backyard – and what better way to top off a great meal than with an all-American dessert – APPLE PIE! Well, I’ve made apple pies before, so that was no challenge. But I had a special request to make a peach cobbler, especially with peaches being in season. 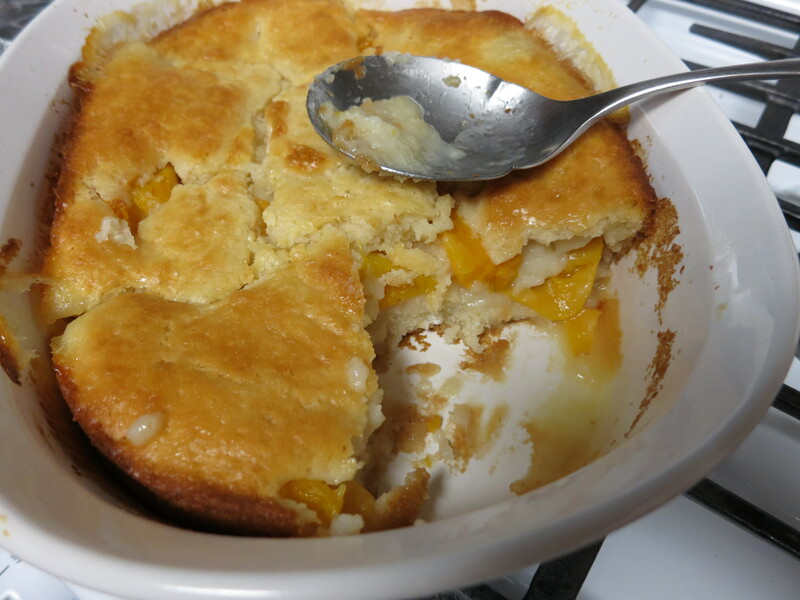 Of course I’ve never made peach cobbler before, otherwise I wouldn’t be blogging about it. I went to my favorite recipe search engine [GOOOOOGLEY GOOGLE!] and the first link to pop up was Paula Deen’s Peach Cobbler Recipe from the Food Network website. Now, I know Paula’s having a pretty rough time these days, and I’ve made fun of her in the past (excessive butter reference), even used her in a food challenge before, but I’m still a fan of her food and her recipes. And apparently a bunch of people are, too, because her book sales increased over 1000%! So if anyone wants to donate some of Paula’s cook books to me while they’re hot and before Food Network erases all of her recipes from their website (I actually have no idea what the Food Network has planned), that’d be awesome possum, because I’m still sticking to whatever I can find on the Internet. That’s another purpose of the Internet – feeding me. Ok, here we go YAWLL. Paula wanted me to use fresh peaches (I even watched the old video from the 80s or 90s when she looked way younger), but the peaches I saw at the market didn’t seem right for the job, so I stuck to canned peaches without sugar. 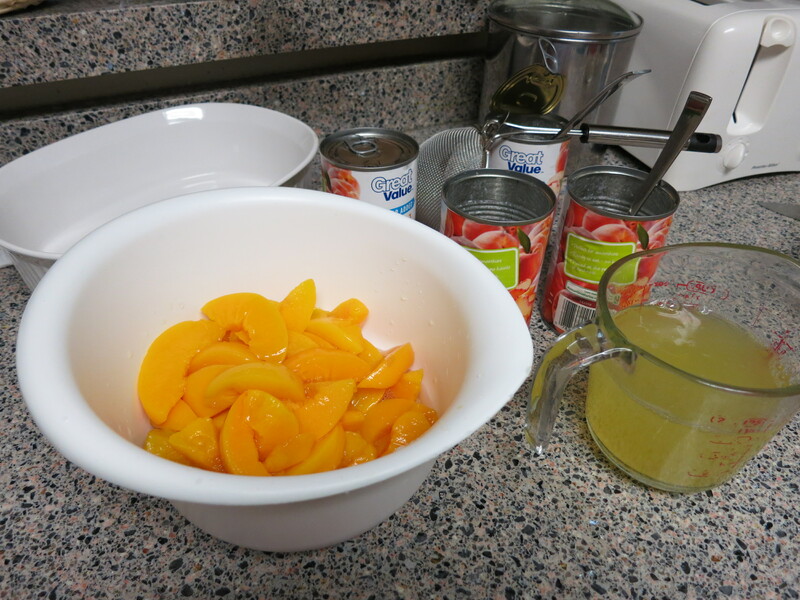 I drained the peaches from the canned syrup, but kept some of it in case I would need it again later. 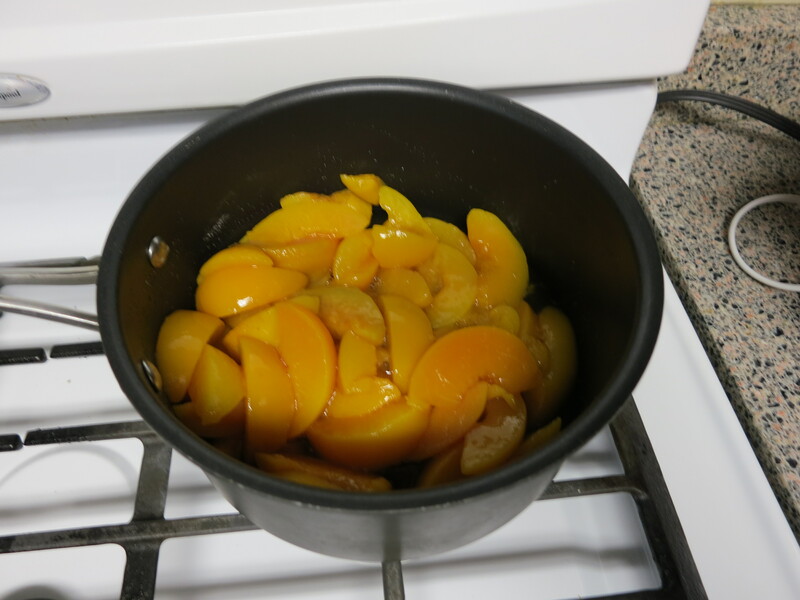 Even though the peaches were soft already, being canned and all, I still put them in a saucepan over heat with some sugar (not the entire cup, because the can said that the peaches were already sweetened with Splenda) to mix. In the meantime, I put this entire stick of butter in the preheated oven to melt. Signature Paula dish, rightchere. While we wait for this butter to melt, let’s watch this SNL skit with Paula Deen on Weekend Update! 🙂 Booter and aoil. So while the butter was melting in the oven, I prepared the flour mixture. And poured it on top of the baking dish filled with melted butter. 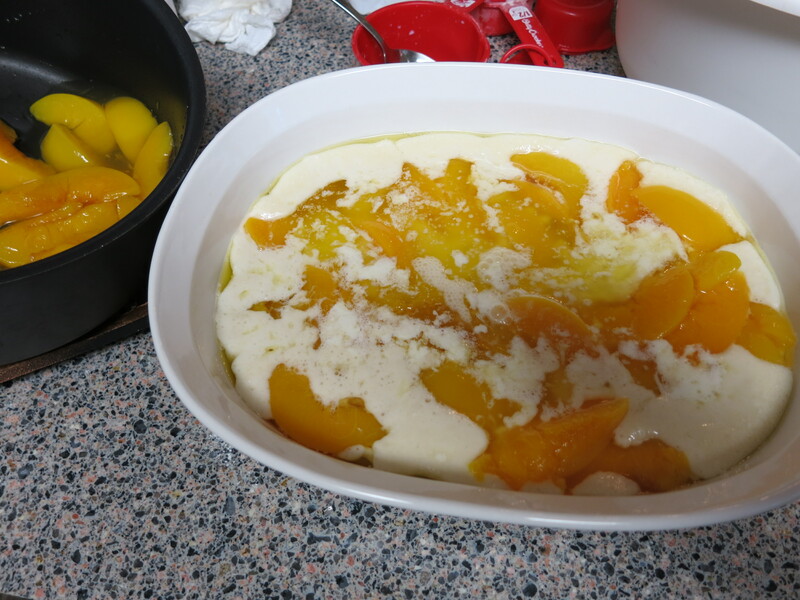 Then I took the peaches and gently placed them into the mixture. NO STIRRING!! 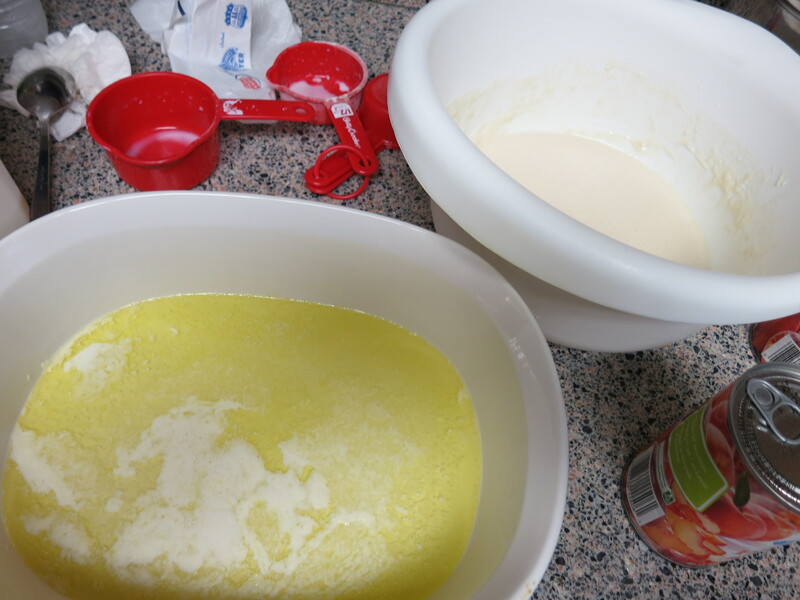 The flour mixture will rise to the top. After about 45 minutes, this delicious concoction emerged from the oven. I left it in there until the crust turned a nice golden color. This dish was a hit – gone in one day! I should have been careful about what kind of butter I was using, because apparently I used salted butter instead of unsalted, and it does make a difference in taste. I was told that the bottom (uh, the buttery part) tasted really salty and contrasted with the sweet peaches. In the future, I’ll read the butter box. Man, were those peaches sweet. And with a huge scoop of icecream….what a perfect summer dessert! Our 4th of July guests got to enjoy both apple pie and peach cobbler after an afternoon of grilling – pretty great if I do say so myself! Happy Birthday, USA! Rematch? 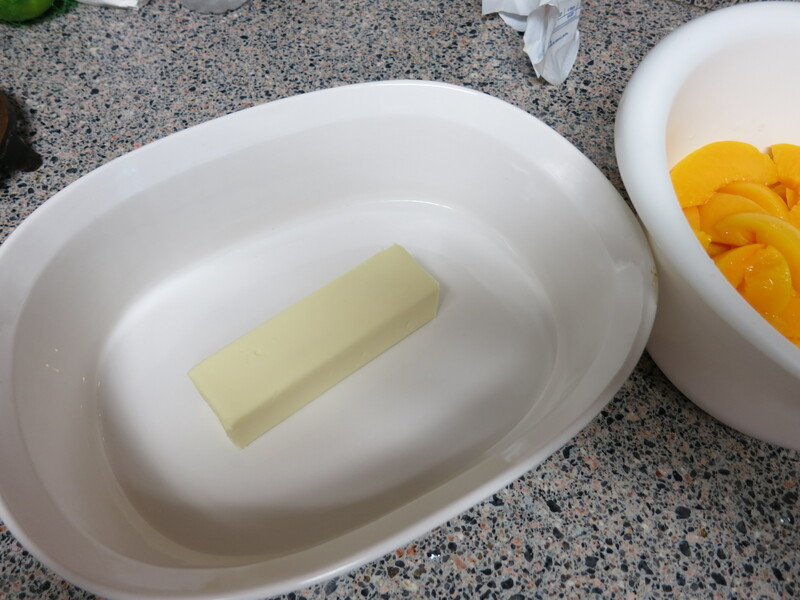 : I’ll change the butter next time. I will definitely do it again!